The Sterling Dressage Package - Featuring the Bates Dressage Saddle Includes Black Leather Bridle, Girth, Saddle Pad, Bit, Stirrups, Leathers, etc. Save money and hassle and buy our popular package all at once! Bates Dressage Saddles are the most innovative in the world. Combine the industry leaders in problem solving for the development of truly innovative solutions in saddle design, with the knowledge and experience of world-leading dressage riders. CAIR air cushion technology provides significant performance advantages in the way it distributes the rider’s weight and cushions your horse’s back. •	EASY-CHANGE Gullet System:you can select the optimal gullet width for the horse’s current shape and muscling •	EASY-CHANGE Riser System: make adjustments within the saddles panel for the optimal balance and clearance. Adjustable Ergonomic Stirrup Bar can be easily re positioned by simply lifting the catch and sliding the bar to suit your individual position.Saddles come with a 5 year guarantee on the tree! Seat sizes available are: 17 inch, 17 1/2 inch (most people's size), 18 inch. Looking for a saddle that will actually FIT your Friesian horse, with excellent quality, AND is durable and affordable? This saddle is your answer to a good fitting saddle for your friesian. Our saddles are well designed, well constructed, offer exceptional quality at a moderate price, with the NEW CAIR technology, AND great for all around pleasure/trail riding! This saddle comes with the MEDIUM gullet already installed. Additional gullets are $50/ per gullet; Available in a wide gullet and extra wide. We have taken the problem "fit" out of the saddle equation for your friesian horse! Western tack package includes saddle AND matching western bridle, reins, and breast collar! Available in all black or with the white trimmed stirrups, horn, and seat (as shown). Look no further for a high quality, extremely comfortable western saddle that you know is going to fit your Friesian horse. After 3 years of developing and searching for the best possible fitting Western saddle for our Friesian horses, and as owners of a Friesian that has won multiple Regional & National Western Pleasure Championship titles competing as a western pleasure horse, we are proud to present our "Sterling" Western saddle [named after our National Champion western pleasure horse, Sterling!]. We can proudly say that we are the only importers offering a Western saddle specifically designed for your Friesian! 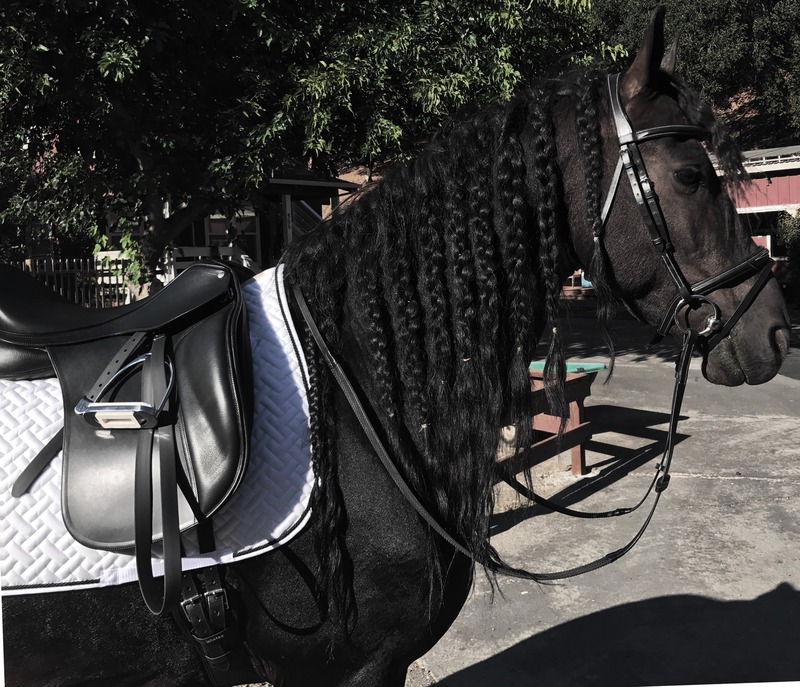 This has not only resulted in a saddle that is extremely comfortable for the rider, but as well for your Friesian horse.The "Sterling" western saddle is hand crafted by one person, and shipped to your door within 3 weeks, or less, of ordering (or we can send your western saddle WITH your horse, if purchasing a BSF Friesian). We always have a nice selection of new Sterling western saddles in our tack shop in Fairfax, as well. We use only the best leather to make this saddle, and we love the durability of these saddles. This is our saddle of choice for trail riding:)The saddle is built from cowhide leather which contains a high oil percentage for the best suppleness and makes it long lasting. The "Sterling" Western saddle is a close contact saddle with a deep seat for the best communication between you and your Friesian. We offer a warranty of 5 years on the saddle tree. You can't beat the look and fit on this black western saddle, custom made for friesians. This saddle is built on a steele equi-fit fiberglass tree and contains 7/8 double rigging with stainless steel dees. Special features include a matching back strap, rawhide silver laced cantle, basketweave tooling, and engraved silver trim with a black finish. You couldn't ask for more.Price INCLUDES saddle AND matching western bridle, reins, and breast collar, all with incredible sterling silver accents, making this package appropriate for the showring, as well!! Tree: Steele Equi-Fit Fiberglass, 12 inch swells, Full Qtr Horse Bars; Draft Horse Bars w/ 8" gullet also available for VERY baroque/heavy horses (8”gullet and extra long tack). Cantle: 5 inch Gullet: 7 1/4"
Seat: 12-17 inch, padded. [Youth:12"-13;Small Adult:14; Average Adult:15; Large Adult:16; Extra Large Adult: 17. Skirts: 27 inch (shorter on smaller seat sizes)Fenders: 18 ½ inch x 8 1/2 inches, with 2 ½ Stirrup leathers with Blevins Buckles. Finish: Engraved silver- Black Finish.High quality Black Cowhides for the best comfort. Custom-made saddles, built to your individual specifications for your horse, are not returnable. This Bridle fits our Friesian’s beautiful heads, and comes with a padded head and nose band in beautiful black leather. It comes with the bit is the snaffle we ride all of our Friesian’s in, 5 1/2-6 inch width, which will not pinch your Friesian’s mouth. Get your horse ready for spring and summer with the stylish BSF Continental Sheet. It offers a great polycotton blend which is tougher than 100% cotton, but it gives the same soft feel. Also, this colorfast material is washable and breathable! The features on this great sheet include nylon-lined shoulders which are gusseted for free movement and twin chest straps, and full cross surcingles with elastic inserts. There are elastic leg straps, and fleece at the withers, making this sheet the BEST fitting we have found for our Friesians. You can't beat this breathable, yarn-dyed poly/cotton navy sheet with silver trim! Easy care, colorfast; washes with minimum shrinkage. In navy/silver, Sizes 60"-87" (3" increments). Safeguard your horse from the chills. Our Fleece Cooler is made of warm, double-bonded anti-pill fleece in a popular Gold/Whitney stripe print, turquoise, or navy-- perfect for wicking away the sweat following a workout! Double-bonded anti-pill fleece Ideal for travel, cooling out, or as an extra winter layer. Twin chest straps. Low cross surcingles. Tail cord. Your horse will be styled and ready to attend any horse show in this beautiful cooler. Our Horse Cooler wicks moisture so quickly, you can leave the barn confident that your horse is cool and dry. These coolers dry in half the time other fabrics take, and are warm and antibacterial. Our BSF cooler provides custom features at a very affordable price, in lovely vibrant colors. Our coolers are specially designed for traveling and cooling down after workouts. They feature adjustable chest straps, fleece overlay on the withers, smooth shoulders, and a lightweight fleece outer exterior. Every friesian needs to have one of these coolers; they breathe easy, wick easy, and are machine washable. Water-resistant, yet breathable, medium weight outdoor blanket with optimal ventilation. This blanket has Denier Ripstop outer shell and is Waterproof and Breathable. -WARM 220 grams of polyfill, medium weight, NO RUB nylon lining, features low cross surcingles, and leg straps. We currently carry it in BLUE. --This is a fantastic turn out blanket designed to provide your horse with a lightweight, waterproof and breathable turnout option at an affordable price. Features of our turn out blanket include extra room on top--for grazing animals, a breathable, durable ripstop polyester and waterproof outer fabric with taped seams and strong denier ripstop outer shell, twin chest straps and adjustable leg straps. The BSF turn out blanket is designed as a tough and durable turnout for a wide range of conditions. The withers are protected with a fleece covering. 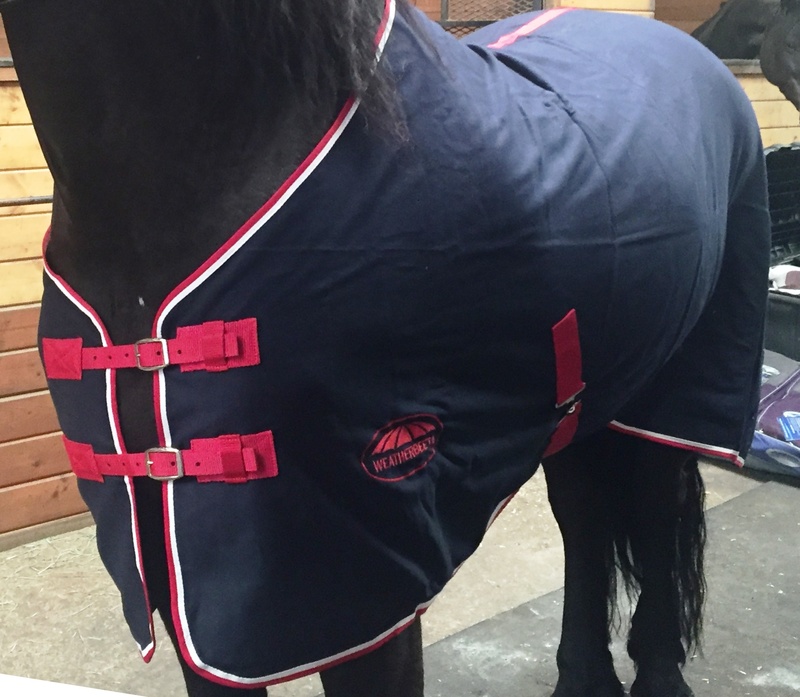 BSF turn out blanket is stylish, and will protect your horse from cold and damp days in the winter time. 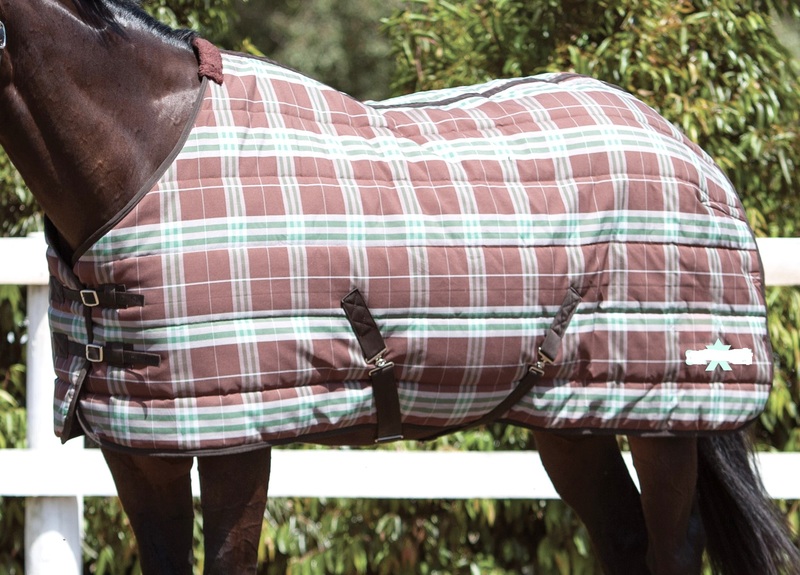 If you like to turn out your horse, and need to protect him from inclement weather, this is an ideal blanket for you! It has proven to be not only good looking, but also durable on our Friesians, and is resistant to abrasion. In addition, the blanket is Teflon® coated to shed dirt and resist staining and is constructed with every feature of quality construction. We chose these blankets, because they are durable with our Friesians that are turned out together (and sometimes rough on their clothing), and consequently it fits them better than any other turn out blanket we have tried, as it gives them room to put their heads down and graze, and is the ideal weight and durability for most horses in most climates. We recommend our blankets in sizes 74, 76, 78, to fit most Friesian horses. For our horses stabled inside a barn, we use the Jasper Wave Quilt Blanket. Features a double buckle crown, rolled throat with snap and adjustable chin strap. Crown and nose are fully lined and double stitched; cheeks are triple stitched. 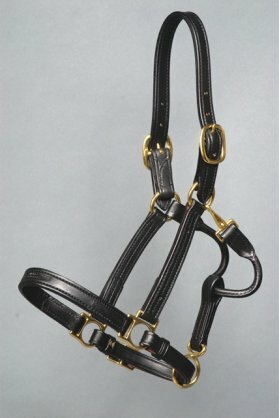 Black bridle and black harness leather with solid brass hardware and 1" strap throughout. Edges finished in black for a top show look. Comes with a “Black Sterling” ¾” brass nameplate. This is the BEST LOOKING Black Leather Halter we have found, accented with brass buckles and snaps, for our Friesian horses. The finest 100% Australian premium pure natural Merino sheepskin which combines the most effective cushioning with luxurious comfort for the horse and rider. *Light and breathable, allows for the natural circulation of air through its fibers. *Provides a therapeutic cushioning. *Temperature balancing acts as an insulate and draws away excess heat and moisture. *Environmentally friendly. *Easy to care for (machine washable) and hard wearing. Luxuriously soft Merino sheepskin under a quilted top. Light and breathable, Roma Merino sheepskin saddle pads allow for the natural circulation of air through its fibers. The natural sheepskin is temperature balancing, acts as insulation against cold air, and draws away excess heat and moisture as your horse warms up. Easy to care for, the pads are machine washable. White quilt with natural sheepskin or black with black sheepskin. 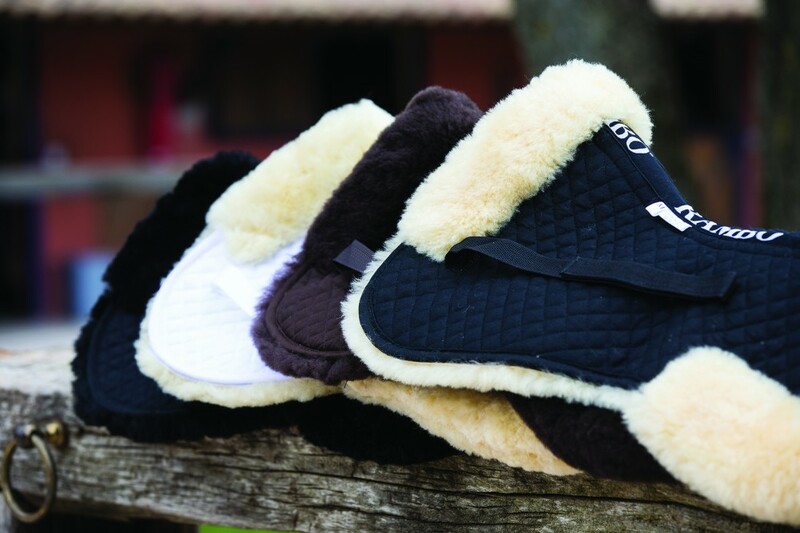 Our Sheepskin Half Pad is made from high quality sheepskin for comfort on the horse's back. The spine of this half pad is contoured to improve fit on the back and relieve pressure on the withers. The Rambo Sheepskin Half Pad has generous girth strap and adds a luxurious, stylish touch to any saddle pad.The Sheepskin Half Pad is an excellent product our customers with FRIESIANS really love! 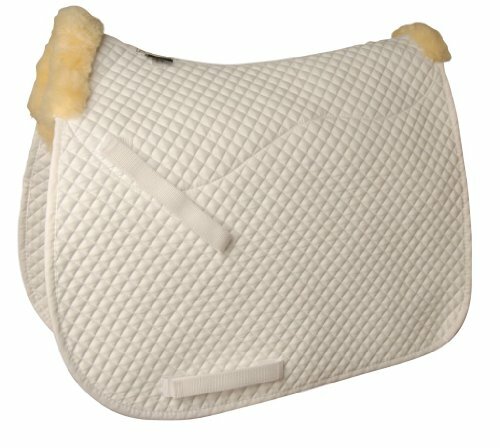 Our sheepskin Half Pad is a soft and sweet half pad, by Horseware, designed with high quality sheepskin to help keep your horse in comfort. In addition, a polycotton top section is featured, as is a contoured design. Available in all Black, White/Natural, and Black/Natural. Need more information about the Rambo Sheepskin Half Pad? Get a quick answer by calling janna at 415-272-2112! BSF offers a stellar selection of dressage snaffle bits sized to FIT your friesian, in varying widths and styles, 5"-6" wide. If you are purchasing your friesian from us, and purchasing a bridle or tack package, we know which bit is best for YOUR horse, and will include it on your new bridle. Let us help you find the perfect dressage bit for your horse! Many of our horses use a double jointed snaffle, which has 3 pieces in the mouth of the horse. This makes the V-shape turn into a U-shape, which is slightly more anatomical. The sides can still be moved independently, so it works the same way as a single jointed. KORSTEEL stainless steel Fillis Style Stirrups with white rubber pads. A classic and economical choice for all disciplines. Slimline Stirrup Straps provide superior comfort and optimum performance, by reducing the bulk under the rider’s leg, and minimizing interference. Our leathers have been developed with your comfort and safety in mind. 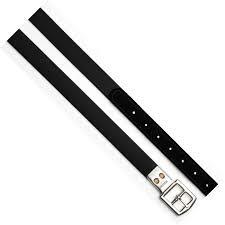 They are extremely supple and slimline, featuring a stainless steel riveted buckle design, reducing the thickness of leather under your leg, eliminating any interference, while the webbing core ensures they will not stretch and cause unevenness.Your tack, particularly safety related items such as girths and stirrup straps should be regularly checked for signs of excessive wear and tear, and REPLACED when needed. We have a nice selection of 58" and 64" black stirrup leathers. If you are purchasing our western tack package---dont forget to get a matching black girth! Our western girth is lightweight and easy to clean; designed using a soft, thick, synthetic material that provides a cushioning effect around the horse's belly. This material is impervious to sweat and will not go hard or collect dirt which causes galling. It has stainless steel roller buckles that are safe and strong, and Flank Girth Dee buckles that enable the Flank Girth link to be attached. This Western Girth is designed with the horse’s comfort in mind! Please specify size when ordering: 43″, 48″, 54″, 58″, 63″, 69″. Designed with elastic stretch, chafeless curved shape and a black Equi-suede finish to perfectly compliment your dressage saddle featuring long girth points. Features central elastic and stainless steel roller buckles. With the addition of a curved shape, our girths reduce the width of material behind the horse’s elbows, helping to prevent pinching of the horse’s skin. Designed with the unique advantage of having the elastic through the center of the girth so the entire girth stretches with the horse as it works. This design ensures that pressure is evenly transferred to the horse over the whole surface of the girth with no pressure points or ridges. The soft, anti-galling material is sweat-resistant and easy to wipe clean. Specify Size: 24"-40"
We have a large variety of elegantly designed saddle pads with contrasting outer trims, many with a double cord. Our large Dressage Pads offer practicality and looks in a generously-sized quilted pad. With a cotton/poly quilted top, rolled piping and a 100% brushed cotton bottom for a non-slip grip. Includes billet straps and girth loops. Every rider needs more than one saddle pad...1 for the horse and 1 in the laundry! Here is an elegant show or schooling pad that won't bunch up under the saddle. With proper care, this durable pad holds up to heavy use! Pads available with or without BSF logo in one corner. Specify color when ordering. The Friesian horse is generally wider in the back than a warmblood, or many other breeds, and the Friesian horse has bigger ribs and they stand more round. After numerous requests to sell our tack WITH our horses, we decided to design, develop, and import saddles and bridles designed specifically for our horses. That way we COULD sell each horse’s tack WITH the horse! We noticed over the years, some of our Friesians who we used normal saddles on, with a smaller tree size, were sometimes getting back and shoulder problems. 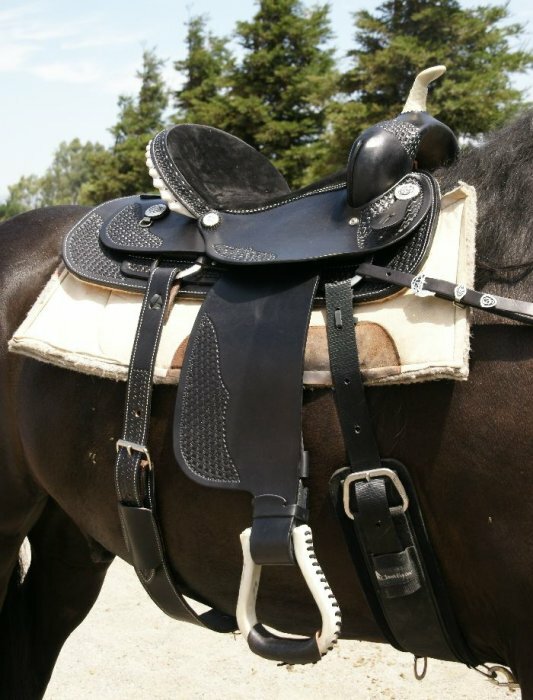 The Sterling saddle is extremely comfortable for our horses, as well as their riders. This saddle is recommended by physiotherapists. The size of the saddle is for the most common size of the Friesian horse. The size is exactly the same in inches as the original Fryso saddle, but this saddle is less expensive and more durable! Fill out this form and send to Janna if you have a difficult to fit horse. PayPal account holders only need to enter their email and password. PayPal accepts Credit Cards, Debit Cards, etc. in most Countries and Currencies. $110 USD, includes insurance. Shipping and handling per bridle or cooler is $35/each; shipping for our winter blankets is $35 per blanket. It doesn’t matter where in the US we ship; the cost is the same if we ship to New York or California. The tack package will arrive in 3 weeks or less. Please include your complete address and phone number, when sending your check to Janna Weir, 192 Cazneau Ave, Sausalito, CA 94965. You may return any unused tack within 15 days of purchase for a refund, minus a 10% re-stocking charge.